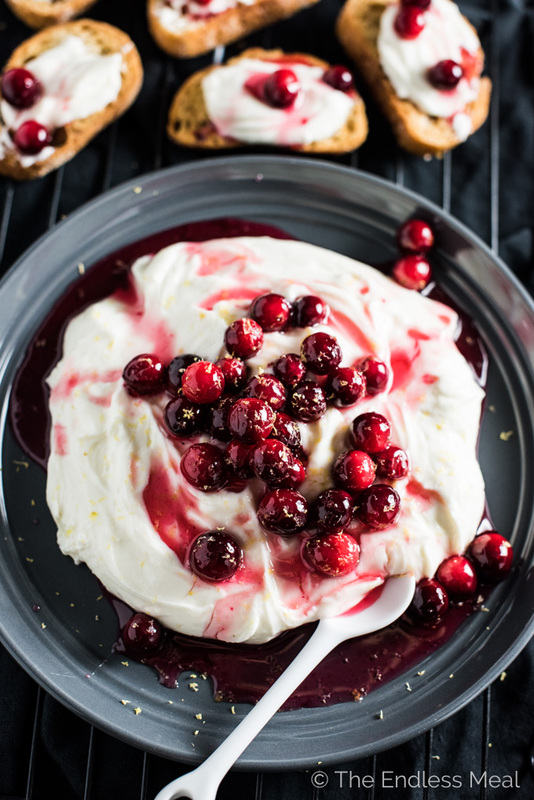 This delicious Lemon Whipped Ricotta is topped with a simple to make cranberry honey. It's a super easy to make appetizer recipe that will be a hit at any party. It's New Year's Eve!! It's time to eat, drink, and celebrate. Are you ready to put your dancing shoes on? ? ? ? I bought the cutest little pair of sparkly red Mary Janes for little Ava. I figured that just because she can't walk yet doesn't mean she can't be twirled around in pretty shoes. It's taking all the willpower I have not to go shopping for a matching, stiletto version for myself. What about you? Are you ready for the big night? I'm about to go join the rest of the procrastinators and stand in line for last minute bottles of bubbles and NYE noise makers. Seriously, why must I leave everything to the last minute?! This lemon whipped ricotta is for all of us who haven't planned ahead. It's an EASY last-minute appetizer recipe that will take you all of five minutes to whip up. Have you had whipped ricotta before? It's the creamiest thing that feels like pure luxury. 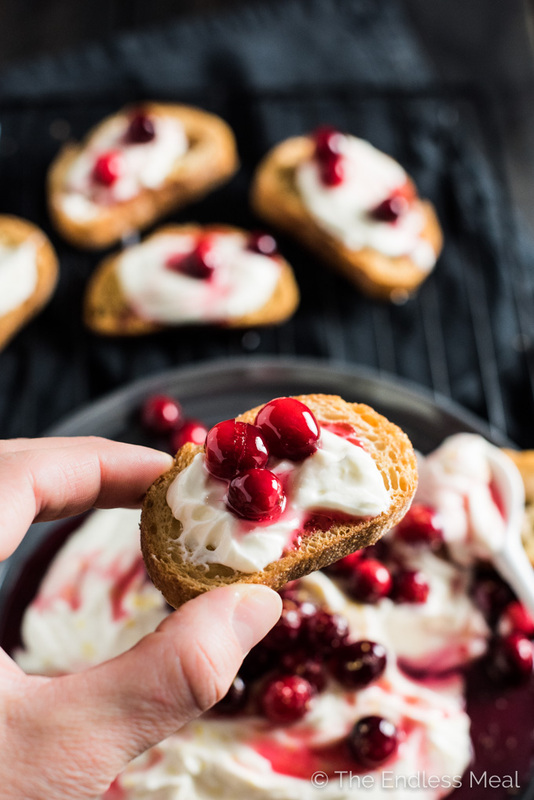 The subtle sweetness from the honey with the smoothness of the ricotta makes this pretty dish straddle the line between appetizer and dessert. It's magical. I love how elegant lemon whipped ricotta is. It feels like a grown-up treat, even though any kid in sight will devour it within minutes. It's beautiful for a New Year's Eve party, but next year I'm making this for Christmas. The red and white scream holiday party. ♡ Quick simmer some honey and cranberries. ♡ Give the ricotta and lemon and little whip around in your blender. 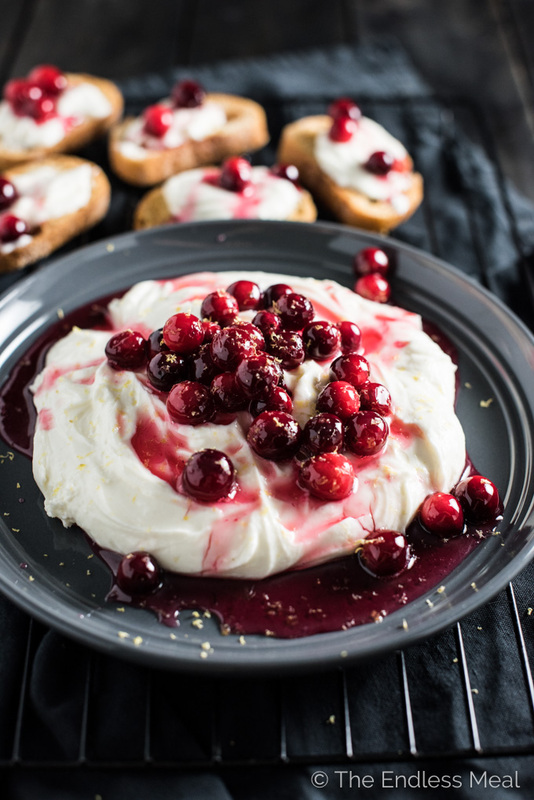 ♡ Pour the ricotta onto a plate and drizzle with the cranberry honey. Did you see how ridiculously easy that was? When I make this lemon whipped ricotta, I like to let it sit in the fridge for a few minutes before I plate it. It gets a little runny after you blend it and chilling it will help it set again. If you don't have time to chill it, don't worry. Just whipped ricotta will spread a little flat on a plate, but it will taste exactly the same. If you make this Lemon Whipped Ricotta make sure you snap a pic and tag #theendlessmeal on Instagram so I can like and comment on your photos. I love seeing TEM recipes you create! And the cranberries, honey, and cayenne to a small pan over medium-high heat. Bring to a boil then remove from the heat when you hear the first cranberry pop, about 30 seconds. Add the ricotta, lemon zest, and lemon juice to your food processor or blender and blend on high until smooth. Pour the ricotta onto a plate, top with the cranberries and honey and a little sprinkle of black pepper. Serve with some toasted baguette slices. If you drizzle your baguette slices with olive oil and sprinkle some sea salt over them before you put them in your oven they will be extra delicious. This looks both super easy and super delicious. Those are the best sorts of recipes, right? I love the addition of the pinch of cayenne, too! I’m with you there, girl! Easy and delicious recipes are my fav!